Ford tinkered around the edges making changes to the 2019 Ford F-150. 2019 Ford F-250 vs. 2019 Ford F-350: What's the Difference? It's all about towing and payload. 2019 Ford F-150 vs. 2019 Ford F-250: What's the Difference? Towing and hauling capacities set these two apart from one another. What's the Best Ford F-150 You Can Get for $30,000? There are lots of great current-generation F-150s available at this price point. A Ford Raptor for under $30,000? Yes, it exists. Barely. Although you may not realize it from a quick glance, the Ford F-150 is all new for the 2015 model year. Yes, the pickup shares some major styling details with its predecessor -- but under the skin, everything has changed. There's new aluminum construction, for example, that has shaved roughly 700 pounds off the truck's curb weight. There's a new engine, and there's a heavily upgraded interior. How do we like the all-new 2015 Ford F-150? We've gathered our thoughts below. Although the F-150 is redesigned for 2015 with new engines, new styling and a new interior, the truck's most important update is something you can't see: aluminum construction. By switching from steel to aluminum, Ford managed to dramatically cut the F-150's curb weight -- a change that brings about several major benefits. The first benefit is obvious: fuel economy. Since the all-new 2015 F-150 is around 700 pounds lighter than last year's model, the pickup's engines don't have to pull around as much weight as they did before. The result is that the truck boasts improved fuel economy numbers -- especially with its excellent new 2.7-liter turbocharged engine, which we'll cover in more detail below. Unfortunately, Ford doesn't have final gas-mileage figures yet, though the automaker says we can expect a 20 percent improvement in fuel economy. Another big benefit of the aluminum body is that the latest F-150 is surprisingly nimble for a large pickup. At a manufacturer launch event, Ford set up an autocross course for the F-150 -- an affair more suited to a sports car than a full-size truck. The F-150 handled the course with ease, and back-to-back tests revealed a substantial difference between such bulkier rivals as the Chevrolet Silverado and RAM 1500 and the noticeably more graceful F-150. The new F-150's aluminum construction also helps to increase its capabilities. A lighter curb weight means more weight can be devoted to its payload capacity. The result is that a properly equipped F-150 can haul an almost unbelievable 3,300 pounds -- a figure that far outweighs the maximum payload numbers of any full-size pickup rival. The new F-150 offers four engine options. 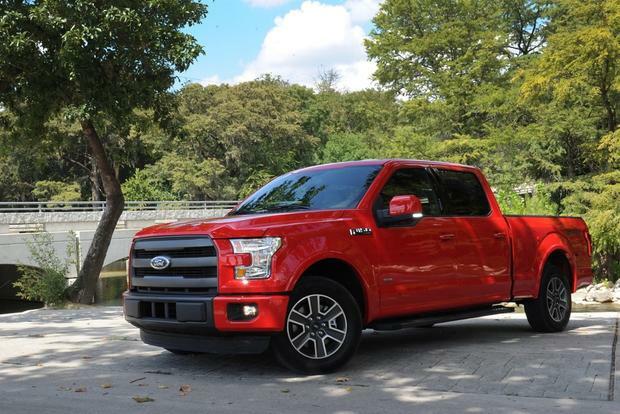 Three of these have been carried over from last year's model: a base-level 3.5-liter V6, a 5.0-liter V8, and the potent 3.5-liter turbocharged EcoBoost V6, which proved its worth in the outgoing F-150 with an impressive 365 horsepower and 420 lb-ft of torque. New for 2015 is a 2.7-liter turbocharged V6, which is designed to bring Ford's EcoBoost technology to a wider array of buyers. Capable of a muscular 325 hp and 375 lb-ft of torque, the EcoBoost costs just $495 more than the 3.5-liter V6 -- and to us, it's worth every penny. Yes, the displacement may seem small, but this engine can tow, haul and accelerate the F-150 with serious gusto, boasting an impressive 2,250-lb payload capacity and an 8,500-lb towing capacity in the right configuration. Those numbers are especially impressive when compared to the standard V6, which maxes out at 1,910 pounds of payload and a 7,600-lb towing capacity. We've saved the best part for last: After about an hour of light-footed highway driving, we averaged more than 23 miles per gallon with the 2.7-liter engine -- an excellent number you don't often see in the full-size pickup world. The engine isn't all about capacity: In real world driving, it also moves the truck with ease; 325 hp is no small number. In fact, we had no complaints about the pickup's acceleration after spending several hours behind the wheel. We were continually impressed with its muscular passing power on rural 2-lane roads. Another area where the F-150 sees major changes is on the inside. Although last year's cabin was functional, it suffered from some serious drawbacks -- namely, cheap materials and a serious lack of high-tech toys designed to cater to buyers looking for a high-end pickup. The new F-150 changes that. The pickup's cabin materials dramatically improved, and the latest F-150 offers a wide array of new features, including a class-exclusive panoramic sunroof, massaging seats and a 360-degree camera. We're also impressed with updates designed to improve Ford's MyFord Touch infotainment system, though we still prefer the Uconnect system used in the RAM 1500. When the Chevrolet Silverado and GMC Sierra were redesigned last year, we thought Ford would have a difficult time following them up. The latest F-150 rises to the occasion, offering excellent capabilities, great gas mileage, an impressive new engine, a dramatically improved interior and a wide range of new high-tech gadgets. Yes, it's true that the 2015 Ford F-150 may not look very different from last year's model, but we can assure you that it's fully redesigned and worthy of a spot at the top of your shopping list.